Advantages: Fast, simple, clean method of adding flexible tracks to Soviet SP guns. Recommendation: Highly Recommended for all WWII Soviet SU-122, SU-85 and early SU-100 guns. During WWII the Soviets were always looking for better flotation over soft ground for their tanks and SP guns. Even though their vehicles usually had the widest tracks and were somewhat lighter than their German counterparts, as the Russian saying goes “better is the enemy of good enough”. One of the methods they came up with was the “split link” track. The tracks developed by the Soviets in the 1930s – mostly by the Kharkov Steam Locomotive factory and based directly on the tracks used by the Christie M-1931 tanks they bought from the US - used a two part track link set – an “A” link with a tooth to engage the drive wheel and a flat plate (“B” link) in between A links. This worked very well for them as it was simple and reliable. But whereas the US and Germans came up with bolt-on track extensions, they did not leave themselves to this method of increasing ground flotation (and reducing ground pressure). Their solution was quite simple: cut the “B” plate link in half and therefore permit inserting a standard “B”link into the track run at that point. This would give a track plate width of 750mm vice 500mm and accomplish the task as needed. For some reason, this was primarily used only for the SP guns - SU-122 and SU-85 being the most common, with a different design used for the Chelyabinsk-built SU-152 and ISU-122/152 guns. There are only a very few photos of these tracks being used on T-34s and surprisingly the same problem exists with actually seeing them applied in this manner. Nevertheless these were common tracks used for the UZTM products. Miniart is “cornering the market” on the UZTM guns with gorgeous kits of the SU-122 and SU-85 released so far, so this is a smart idea to provide as an option for those kits (the kit tracks are fine, but require cement to attach them). 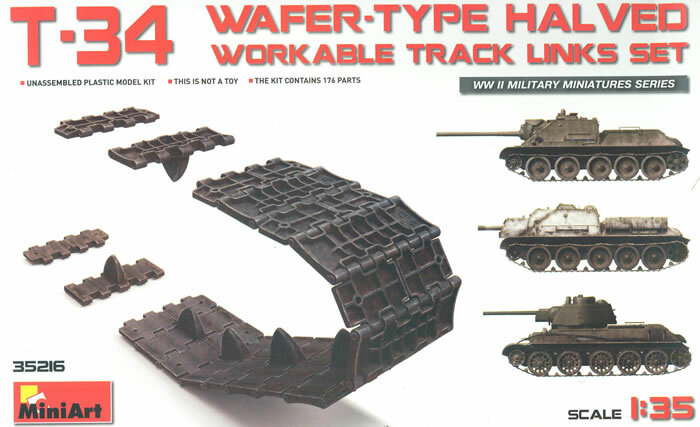 Many modelers prefer tracks which can be painted off the model and installed later, and this caters to them as well as permitting a more realistic “droop” to the track runs. What you get in this set is 96 “B” links with the very fine joint line in the middle of the link, 90 “A” links and 20 small track pins for finishing if desired. They simply snap together using pips on the inside of the “A” links. These are quite tiny so care must be taken to ensure they snap and are not sheared off; I suspect they may be fragile so be forewarned. Only 72 links (36 A/B sets) are required per side, so Miniart has given the modeler a number of extra ones for use elsewhere. Overall this is a clean, neat upgrade to their excellent kits.